YANG BING UPDATE AUG 2013. Yang Bing is doing really well. 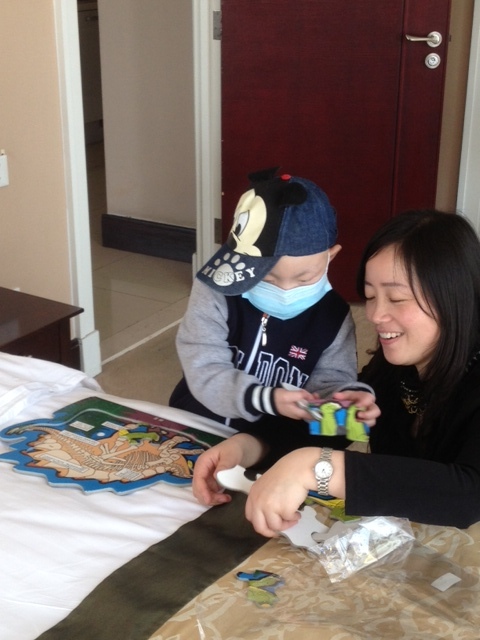 Yang Bing is recovering really well and is getting stronger with each passing week. As the family have to stay in Beijing for a year we offered Yang Bing’s father a job at Roundabout, He really wanted to volunteer in order to thank everyone for helping his son, but we insisted on paying him because…… no thanks is needed, it will help the family get back on their feet and Leslie can’t boss him around if he is just a volunteer!!! Seriously, it is wonderful to have Yang Rui as part of our team and we wonder how we ever managed without his help. Getting daily updates on Yang Bing is the icing on the cake. As soon as we receive some more photos we promise to post them for you. 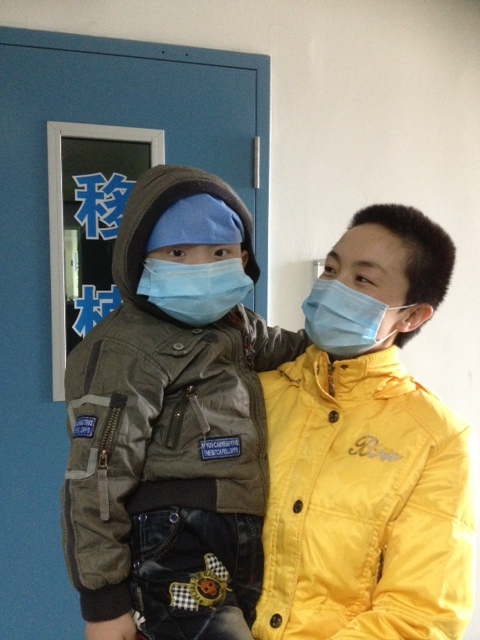 Today, after 4 months in hospital, 54 days of which were spent in an isolation room, BING finally left hospital. Our brave little guy is doing really, really well and is astounding doctors at just how quickly he is recovering. I have attached some photos for you to enjoy. 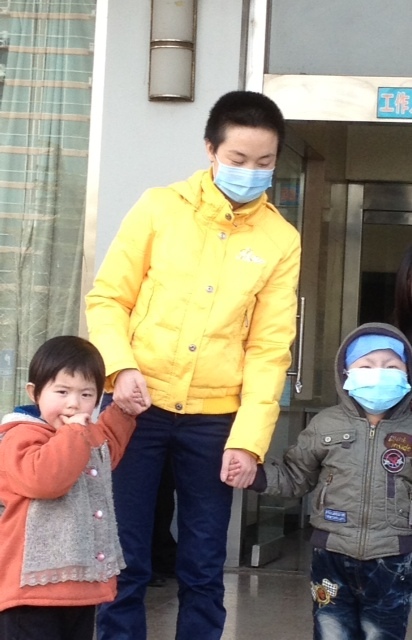 The lady in the yellow coat is Bing’s mum. You will see that she has had her head shaved, this was to limit the possibility of germs being passed on to Bing. She looks gorgeous though, I am sure you will agree. Bing’s father looks very pale and desperately thin and although he is only 31 years old his hair is almost all grey due to the stress he has been under. Our hearts really went out to him. On the way out of the hospital Bing was explaining to people in the lift that he had no eyebrows because of the chemotherapy and that his treatment was very painful but he was brave and never cried. Then outside he was excitedly pointing out flowers and green leaves on the trees ! He was in such high spirits, it was adorable. The hospital only told us yesterday that Bing would be released today ( we thought it would be next month ) and so we were frantically phoning around trying to find a good, but reasonably priced apartment for the family to live in for the next 10 – 12 months. Bing will still have to attend the hospital 3 times a week for the next few months and so we tried to find something suitable nearby, but time was against us. We therefore made a decision to pick up the family from hospital and take them to a temporary serviced apartment for now. Sadly it is too expensive to consider allowing them to stay there long term. We have given ourselves one week to find a more permanent place. Can you help ? The hospital is in the west of the city, past Tian Ye shopping market. At the moment their temporary place is in the financial district, only 5 km’s away from the hospital which is perfect. We are looking for a 2 bedroom apartment with a small kitchen. MUST be very good condition as exposure to damp, mould, toxic paint etc… could be potentially fatal for Bing. Do you happen to be the manager of a serviced apartment building ? Do you know someone who is and would have the compassion to rent us a space at a special low price ? ( We still have money from the amount you all so kindly donated when we launched our appeal for Bing, but we do need to make this money last for another 10 months – and it has to cover all future medical and living expenses ). Bing has to follow a special diet for the next year and all of the family is in great need of some nutritious health boosting foods. If you would like to donate any fresh fruit, vegetables, wholegrain bread etc … then please do pop it into the Roundabout store and we will be sure to pass it on to them. Bing’s parents are struggling to know how to express their gratitude to you all. It is deeply humbling. Thank you everyone, thank you from a desperately grateful mother and father and from everyone at Roundabout. PS. 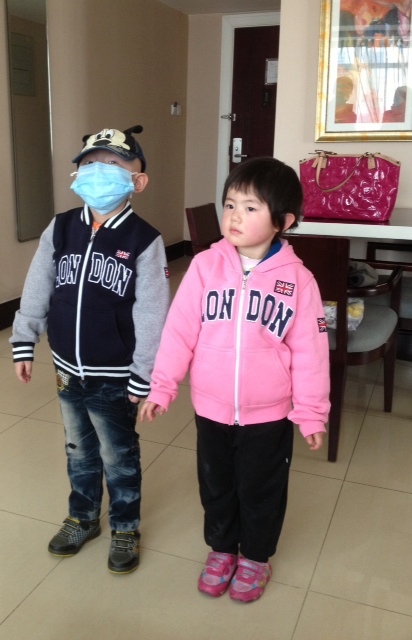 I brought Bing and his sister, Qian, some sweatshirts back from my recent trip to London ( to see the Queen ! ) don’t they look cute in them ? !